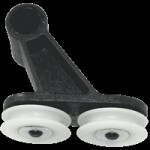 White plastic pivot with adjustment screws, allowing for an easy adjustment of your shower door. Sold individually. Magnet for door and closing jamb of Manhattan Maax Pivolock door Sold in 72" lengths Width 10mm or 3/8" Thickness 4mm or 5/32"
Maintenance-free, 3/4 inch white nylon rounded roller with stainless steel ball bearing. Sold individually.